H3 Zoom’s Façade Inspector was successfully test-bedded in Singapore as part of an Innovation initiative led by JTC, the country’s leading commercial real-estate infrastructure developer, under the Ministry of Trade and Industry. The solution slots into an extremely precise and existing engineering workflow, making it easy for contractors, building owners and facilities managers to gain an immediate benefit from AI technology. H3 Zoom was put to the test on several JTC properties, including the landmark buildings in the one-north district such as Fusionopolis, Biopolis, Ayer Rajah Crescent, as well as a diverse collection of building structures of varying types. 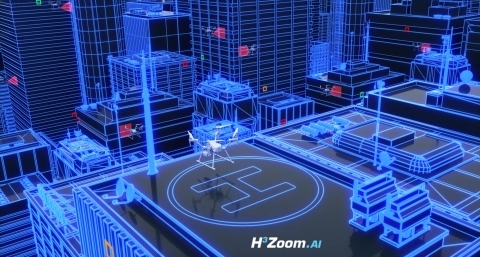 Additional H3 Zoom launch partners (video) include Singapore Land Authority as well as IBM, with whom H3 Zoom has been working with on a number of new developments – to be announced shortly. “We’ve understood that successful AI-services will be task-specific, use-case specific, and vertical-specific. H3 Zoom.AI will turn each of these specific processes into digital equivalents for easier adoption” said Shaun Koo, co-founder and CTO of H3 Zoom Pte. Ltd.